We are, once again, privileged to be playing host to willing volunteers. Paul Johnson, a tree surgeon from Buxton, Derbyshire, his 13-year-old son, Chay and chainsaw-toting workmate Liam, saw our ad in Living Woods Magazine and asked if they could come and stay in January. Of course we said yes. With no disrespect to our previous volunteers, whose help we’ve been so grateful for, a double chainsaw combo with strapping lad on offer made us feel like we’d pulled the handle on a one-armed bandit and watched three lemons come up. Well, perhaps not three lemons but certainly tree fellers! The video shows Paul felling one of our Corsican pines and the pics show Liam snedding (removing the side branches) and logging a felled tree,Paul climbing a tree to throw a line around an awkward tree to be felled and Chay and Gabrielle supervising a small brash fire to clear some space and warm our toes. Looks very cosy round the fire. There are quite a few people here in frozen England who could do with some of that heat - We've been down to minus 20 - Apparently the temperature in the south pole! Is there a technical/ biological reason for burning the branches? Other than warming your feet that is? Why were we burning brash? A good question J. Ideally, we'd want the cut branches to rot away in place and enrich the soil. In Mycellium Running: How Mushrooms Can Save the World, Paul Stamets suggestes chipping brash and then inoculating it with mycellium which will eat the wood and turn it into soil. We haven't got a chipper that would handle this size and amount of wood and it's too expensive to hire. We have introduced the saprophytic oyster mushroom into the wood, inoculating several stumps and the pine does rot away the quickest. The thing is that as we are doing a large amount of cutting all at once, we've created a huge amount of brash and need to clear some of it up in order to move around. Burning it seemed to be the easiest way to do that. The rest, we'll strew around eveny and leave to rot. I guess that living in Finland, you know a bit about pine forestry? What's your opinion and do you have any advice for us? My father has few hectares of coniferous woodland. 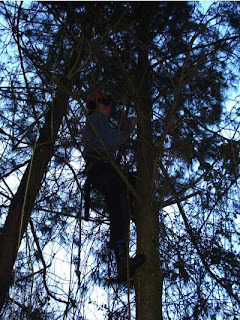 We don't do anything to the branches, although anything thicker than maybe 6 cm might be gathered for firewood. Branches from broadleaf trees like birch disappear rather quickly to the forest floor but fir and pine do take a bit longer. We use a snowmobile with a sleigh to gather the logs to the roadside, so our circumstances are quite different. I don't know if my advice is any good to you. As an advice, you could maybe plan the routes and the felling of the trees so that the branches would not be on your way. 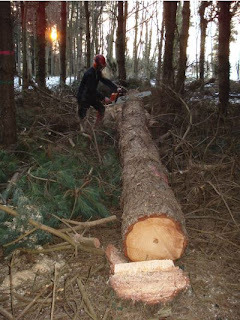 Start felling from the furthest point on your route and work towards your log pile. On the other hand, burning might not be a bad idea. I use wood ash to fertilize my garden, it includes all the nutrients that the tree had except carbon and nitrogen. 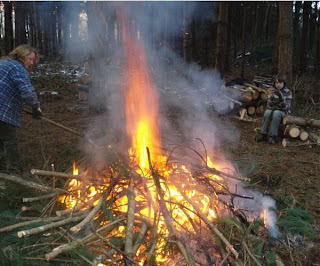 My father even spreads the ash that is produced by central heating of his house back to the forest. Forestry season is just about to begin, we're starting to get enough daylight! Thanks again J for your interesting and helpful comments. We have just one hectare of Corsican pine which has never been thinned or otherwise maintained in the last 25 - 30 years since it was planted. We had a couple of guys from different government forestry departments come and give us advice. They told us we could have an EU subsidy for the first thinning. For that, we had to take out quite a number of trees, then sned them and log them, plus remove all the branches, with a pole saw, of all the trees that were left. That's given us a lot of branches to deal with. The next cut in five years time won;t be nearly so intense, so I shall be happy to let all the side branches rot on the floor and become soil again. I do have a question for you. Generally around these parts, pine is not looked on a good wood to burn in a wood stove, people preferring hardwoods, especially oak. In Finland, I guess all your trees would be conifers (?) so how do you get on burning only pine? And how long you season it for? I answered last week but it seems that the message never got through a filter or something. In Finland, I guess all your trees would be conifers (?) so how do you get on burning only pine? So yes, oak is 20-30 percent better firewood. Accountable things are the moisture content of the wood and the insulation of the heated space. And how long you season it for? Wood is usually seasoned over a year. The most efficiently wood dries during early spring when the wood is not frozen but the airborne humidity is reasonably low. We use a ”cage” made of dog fencing or similar, with a roof of corrugated iron or a sheet of plastic.